William Foyle’s new paintings – an impressively large collection, exhibited at the RCA – stick in one’s mind. They are figurative, but concerned more with the qualities of the paint and its ability to express certain indescribable truths than with precise detail. 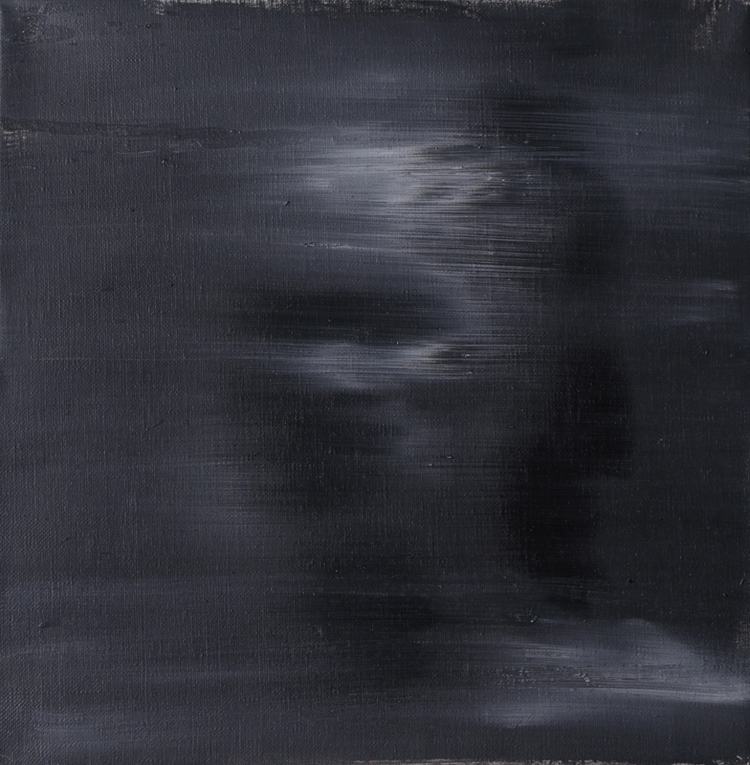 They are the opposite of portraiture in fact: each figure seeming to represent an idea of humanity, a multitude of individuals condensed into one – but rather than diluting their identity in favour of a generalisation, the artist manages to somehow deepen its intensity so that, even without any indentifying features, one has the impression of seeing into their soul. The studies of neanderthals (‘Study of Early Woman’ I & IV, 2014, left and above right) depict totemic figures enshrined in earth colours, the thin paint in loose swathes across the background, elsewhere left dripping. The silent upright figures are defined by highlights and shadows, a white outline, light falling on a shoulder or cheekbone. 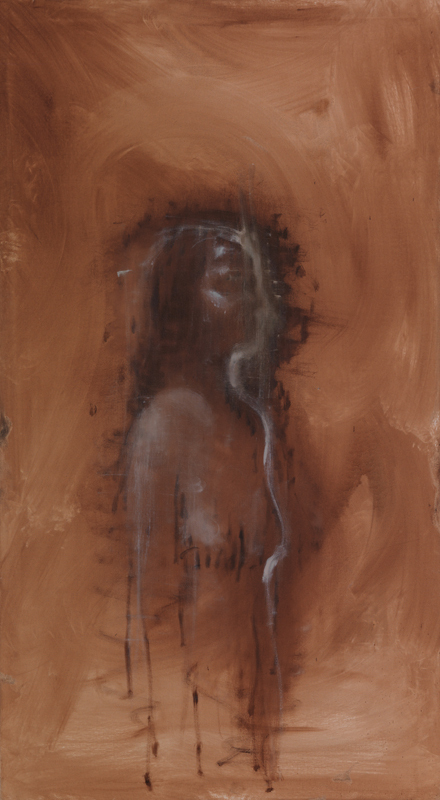 The isolated form, head and torso defined in black and white, recalls the truncated figures of Egon Schiele and Giacometti; the colours are those of cave walls, as at Lascaux, uncovered from the shrouds of time, and speaking of a mysterious civilisation that we can never fully know. 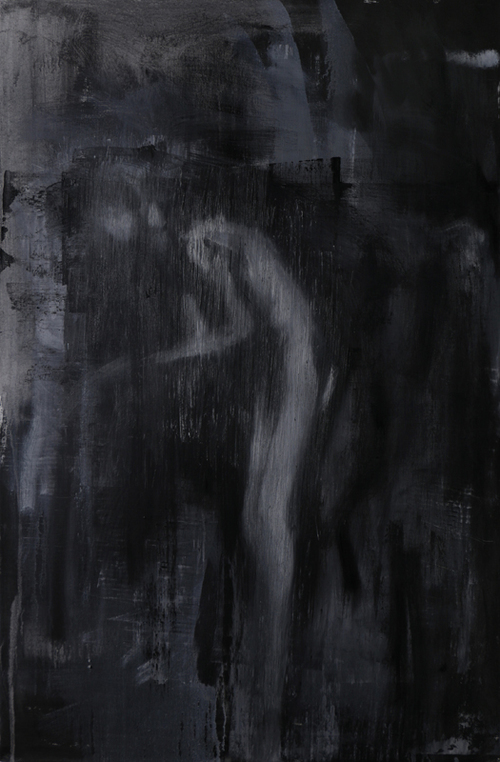 The series of holocaust figures are haunting, ghostlike, monochrome (‘Showers in Lodz Ghetto I’, right, 2015); the large scale canvases are predominantly black and the gallery low lit, so that one treads carefully in a tenebrous world of unspoken beauty and pain. Like Rothko’s Black Paintings there is a sense of existential desolation contained within the pigment itself, scraped back and layered, austere in tone but rich in texture. Some have a religious intensity that combines the symbolism of Munch’s ‘Madonna’ with a tragic vulnerability, as in ‘Figure IV’ (2015, below left), the naked form suggesting a Pieta. 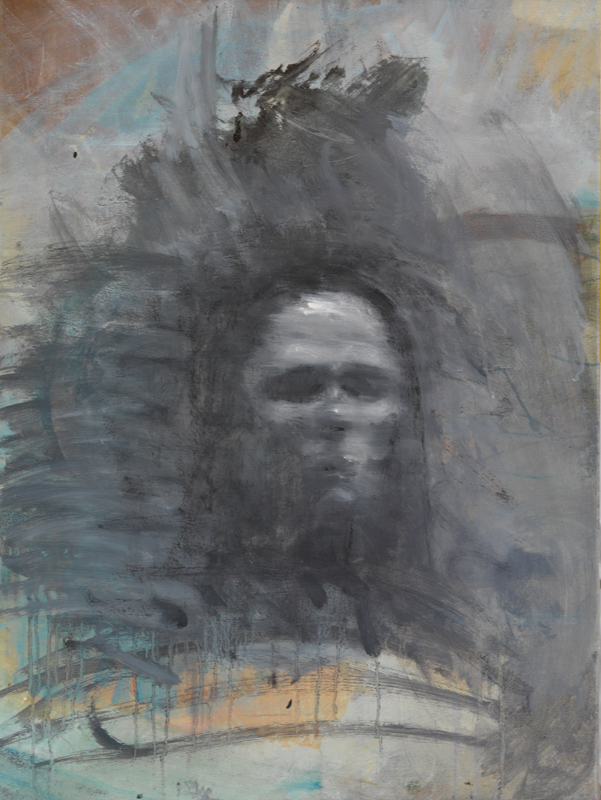 The figures or heads are scraped, scratched, smudged, half-erased, their forms at once emerging and disappearing into the shadows of the painting. It is a powerful metaphor for both the unreliability of memory and the impossibility of knowing all of someone. In the more specific context of the holocaust, it also makes a powerful statement about the calculated erasure of an individual’s identity; the poor skeletal bodies still proclaim their personhood – full of dreams, fears, memories, gradually stripped away, and now unknowable. It is the more tragic for being portrayed in such a restrained and delicate way. 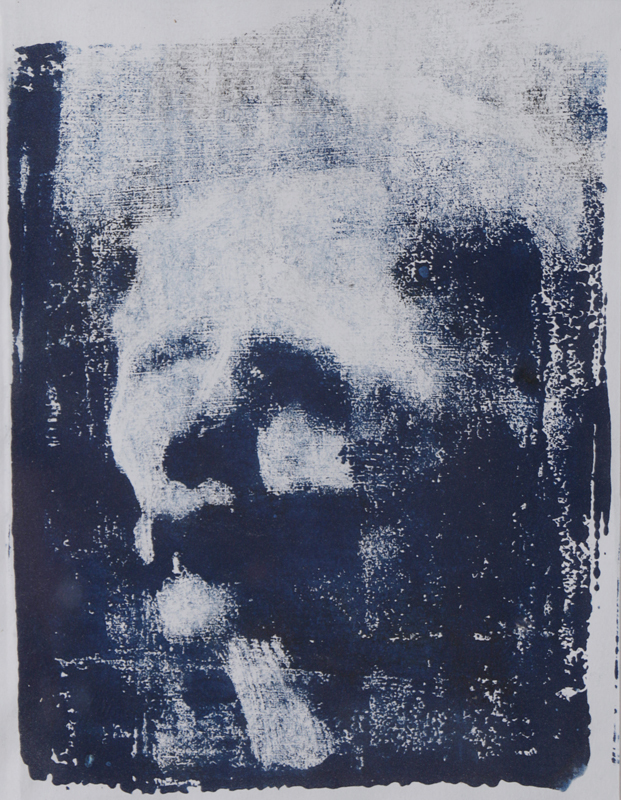 Alongside the canvases are a number of monotypes (such as ‘Head of Eve I’, right) and other portrait heads in oil and acrylic. 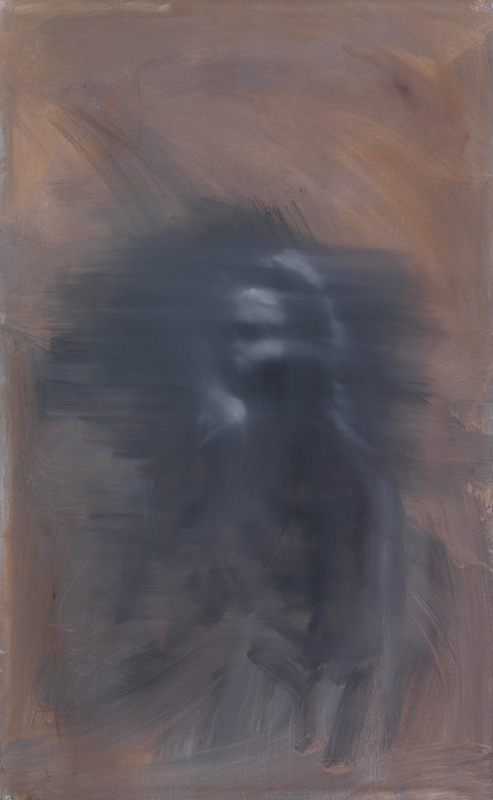 Some reveal elements of Frank Auerbach – in the heavily layered self-portrait with its decisive, energetic brushwork – and others the elusive 1960s portraits of Gerhard Richter, based on snapshots then deliberately blurred (‘Head I’, 2015, top). 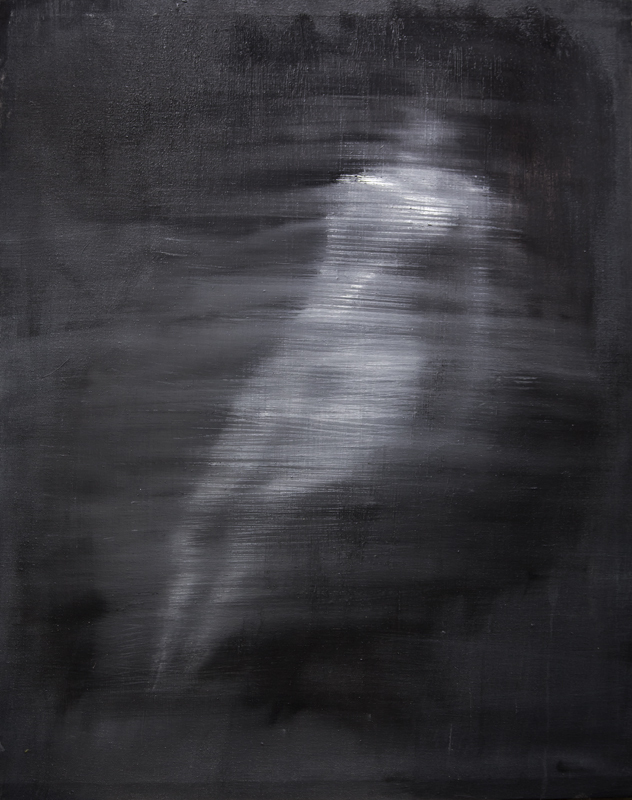 Both artists sought different means to counter the knowledge that painting is an imprecise representation of reality and that the essential nature of subject we see remains mysterious. Foyle, like them, knows this and creates what are more interesting and more rewarding paintings for it. The space at the Royal College of Art has been well selected and curated; each canvas is allowed the space it needs and together they resonate – a tribute to the strong thematic focus of the exhibition. The technical experimentation is fascinating to see, the style subtly changing, but with a confidence and skill that makes me eager to see more.